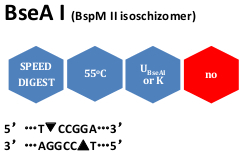 BseAI is a restriction enzyme purified from Bacillus stearothermophilus. Unit calculation assay conditions: 100 mM NaCl, 10 mM Tris-HCl (pH 8.0 @ 25°C), 5 mM MgCl2, 1 mM dithiothreitol, 0.02% Triton X-100, 100 μg/ml BSA. Incubate at 55oC. Absence of contaminants: 400 units of BseAI do not produce any unspecific cleavage products after 16 hrs incubation with 1 μg of λ DNA at 55oC. After 100-fold overdigestion with BseAI, greater than 98% of the DNA fragments can be ligated and recut with this enzyme. Storage buffer: 50 mM KCl, 10 mM Tris-HCl (pH 7.4), 0.1 mM EDTA, 1 mM dithiothreitol, 500 μg/ml BSA and 50% glycerol. Store at -20oC. Reference: Thanos, D., Scarpelis, G., Papamatheakis, J. and Bouriotis, V. (1989). Nucleic Acids Res. 17, 8881.